Today’s music composers and producers have an embarrassement of wealth available to them when they are trying to “simulate” an orchestral performance. It’s not like in the late 80’s or early 90’s when we had synth units with the sounds “Strings 1”, “Strings 2” and “Strings 3”. Today’s composers tools consists of gigabytes of samples, where every possible note every musical instrument in the orchestra is sampled individually, and at many different velocity / intensity levels. The level of detail to which you can simulate an orchestra today is quite staggering. Just listen to some of the tracks, for example, in our “Massive Impact” series, all of which are created with very clever use of sampled orchestral sounds, MIDI, and one or two actual live instruments here and there to “sweeten” the sound. Even so, even in this day and age, only a real orchestra performance is the real thing. Nothing beats the real thing. Humans putting fingers on strings, breath into reeds, fingers on piano keys, in an actual room/hall where they sit together, interact, the sound fills the hall and is captured there and then. with the live orchestra: “Arriving at Haven Village” by Jon Adamich and “A Grand Adventure” by Jack Francis. These tracks already existed in our catalogue, originally made with samples, MIDI, clever programming. We had them “re-done” with a live orchestra and we think they came out great! It cost us an absolute fortune (all those musicians want to be paid, and rightly so! ), but I think it was worth it. Feel free to let us know what you think. We will contact all existing Shockwave-Sound.com customers who bought these tracks from us in the past, and offer them a free download / license for the new real orchestra version. 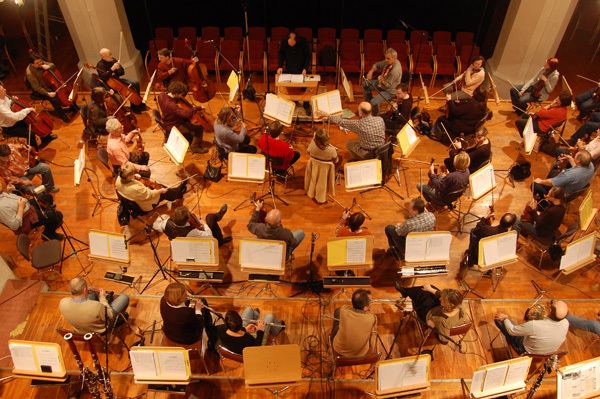 The photo below shows the actual orchestra while recording our tracks. It was recorded in the Frankfurt Oder Concert Hall in Germany, January 2013.